Its not that often that we find ourselves dreaming of returning to a hotel once visited, there are so many stunning boltholes around the world to check off the bucket list… but Vila Monte Farmhouse in Portugal is one we must go back to. We think it’s down to the superbly elegant and boho style interiors by Vera Iachia, her design firm based out of Lisbon. 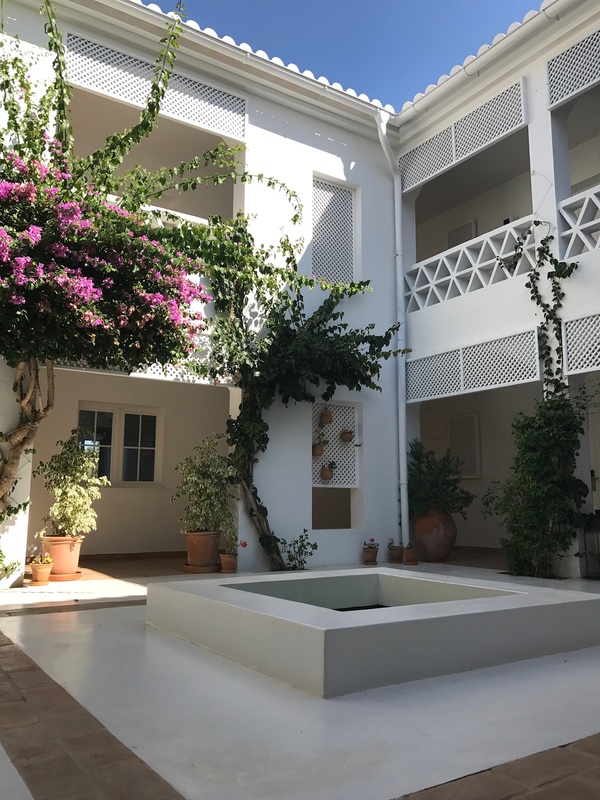 The bright interiors are surrounded by citrus trees and pink bougainvillea, two intimate restaurants, swimming pools, an abundance of inviting spots for lounging and with the ocean just 10 minutes drive, it really is quite special. Renowned for using materials from the local area, Iachia also worked with the local craft and artisans who skillfully interpreted her ideas. Hotel Vila Monte fully integrates all aspects of high-end boutique hospitality with the aesthetic typical of the region. We loved the fresh contemporary and authentic style throughout. The colour palette is driven by shades of the local area and the contrast of light and shadow are regularly used to create space and warmth. Our bedroom was bright and airy, with white walls, nautical blue and white fabrics, and we particularly loved the natural decor, the handsome tree-trunk coffee table, coconut-husk rugs and hand-carved light fittings. In the dining room the lofty rattan lamp shades at night create a very atmospheric and romantic setting, the pretty courtyards and overlooking balconies encourage you to wander and explore. There are bikes too and the staff will arrange picnics, sailing trips and trips to the local market with the resident chef.